Tonight’s romantic task, once Jane had returned home from a lecture at Glasgow Caledonian University, was to back-up Jane’s Mum’s laptop. 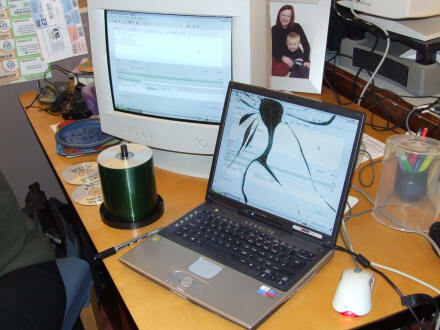 Which, as you can see from the photograph, has a somewhat pwned screen! And in case you were wondering, yes we did try that technical support favourite of switching it off and switching it back on again, but it didn’t fix the problem with the screen. It gets returned to Hi-Grade UK tomorrow for some cosmetic surgery and a screen transplant. Posted on Wednesday 14 February 2007 Thursday 14 December 2017 Categories ComputerTags Computer, PCLeave a comment on Pwned! I’m now officially™ on the market for buying a new computer system, ever since the Saunders’ household Director of Finance gave the thumbs up to my application last week. The thing is now is not necessarily the best time to be looking for new hardware. Not because there isn’t any cool gear out there just now (see Intel Core 2 Duo CPU, Creative X-Fi soundcard, and the latest graphics card chipsets from nVidia and ATi for details); it’s not the hardware that’s the problem, it’s the software. On January 30 Microsoft’s latest operating system, Windows Vista, was released to the public (it having already gone live to businesses at the back-end of 2006). But I don’t want it. I don’t want to ‘upgrade’ to this massively bloated, unnecessarily resource-hungry operating system. It might look glitzy and shiny, packed with Web 2.0-esque gradients, rounded corners and reflections but I don’t want it. I’m happy with Windows XP, thank you very much. 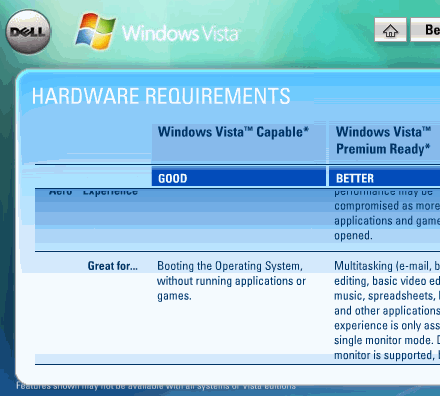 Windows Vista Capable is great for … booting the Operating System, without running applications or games. Hmmm … so if my hardware is Windows Vista Capable then that means I can boot into Windows but won’t necessarily be able to run anything on it! Which is a bit like having a car that you can sit in but won’t actually go anywhere. A bit like a sofa. Powerful graphics card — I’d prefer an ATi rather than nVidia — enough to run modern games on it. By which I really mean Battlefield 2 and Battlefield 2142, and which can support two monitors (CRT or LCD). If possible, one old-school COM/Serial port for my beloved Psion PDA. 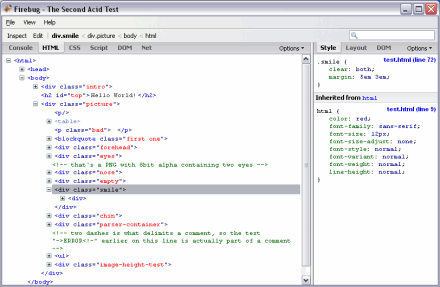 Screenshot of web code, as viewed in the excellent Firebug add-on for Mozilla Firefox. 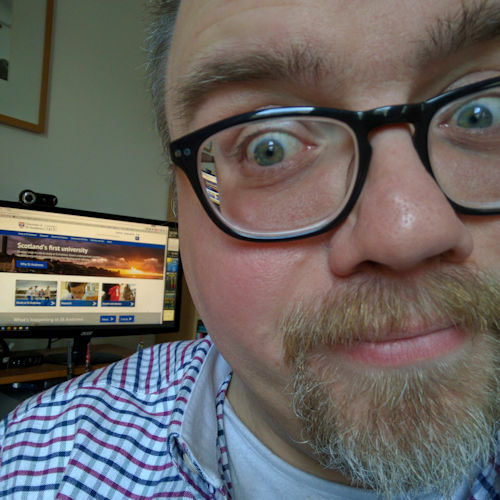 These last couple of weeks I’ve spent much of time, both at home and work, puzzling over a coding project I’m currently working on at the University; which is partly why my blogging activity has been more intermittent than usual. For this particular project we set a baseline of which browsers we would support, based in part from the visitor information we gather on the University’s homepage. This collects information about which browsers are being used, the user’s screen resolution and the number of colours their computer will support; no personal information is gathered. Having examined this data we decided to support Safari (Mac OS X), Internet Explorer 6 and 7 (Windows), Mozilla Firefox (Windows, Mac and Linux) and Opera 9 (Windows, Mac and Linux). I spend maybe 30-60 minutes coding one particular aspect of the site, e.g. page layout, using standards-compliant CSS. 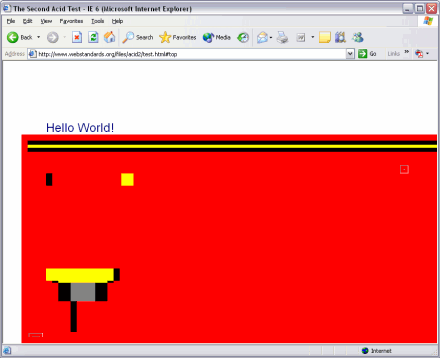 I test it in Firefox 2 – it works. I test it in Opera 9 – it works. I test it in IE7 – it (usually) works. I spend anywhere up to 3 or 4 hours ‘debugging’ it to find out exactly why IE6 won’t render the page correctly. This usually involves either adding an additional CSS statement (e.g. width: 200px;) or completely rewriting the code from scratch. Repeat with the next element on my project spec. As you might imagine, this can get quite tedious. 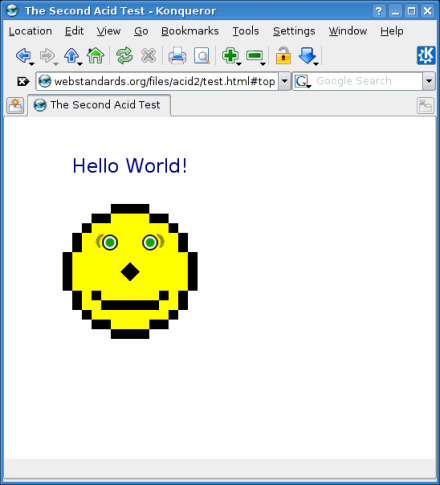 The problem lies in the way that different browser manufacturers have interpreted the web standards as laid down by the World Wide Web Consortium (W3C). These standards, published as W3C Recommendations, are guidelines for, amongst others, browser software developers so that they know how their products should properly render web pages. And as you might guess, some are better than others. Some follow the rules closely; others are a little more relaxed. 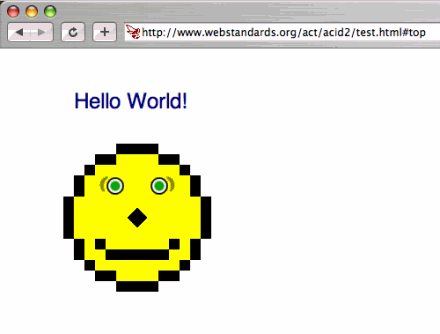 And to test how compliant a particular browser is the kind folks at the Web Standards Project have provided an online ‘acid test’, called the Acid2 Browser Test. 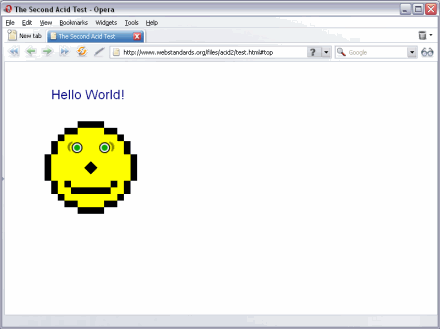 Using XHTML and Cascading Style Sheets — so no graphics, just div tags and background colours, and stuff™ — it tries to display a smiley face with the words “Hello world” above it. As you can see Mozilla Firefox does not too badly. At least, it looks sort of like a face, even it is wearing a mask. If it were a film it would probably be Girl Interrupted. 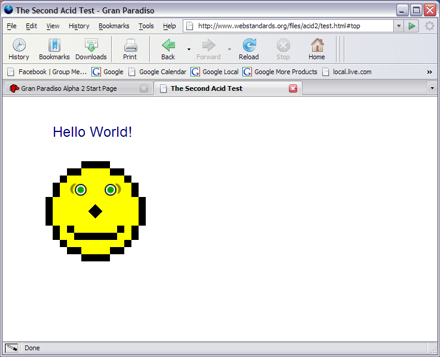 Thankfully the core layout code has been rewritten for Firefox 3 (currently in Alpha) which fixes the problems evident in Firefox 2’s rendering of the Acid2 page. 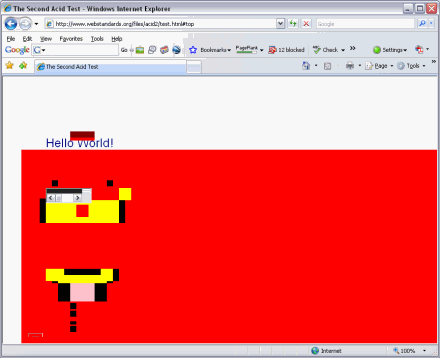 The troublesome Internet Exploder 6 utterly decimates the page. It should perhaps be renamed Internet Exploder and left in a drawer to gather dust. 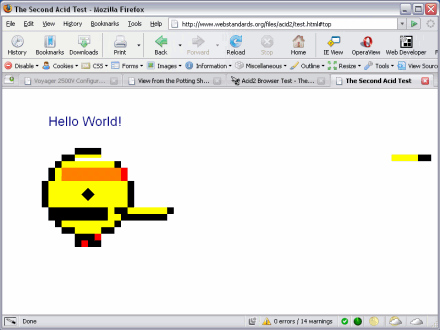 Would you believe this is the world’s most popular browser? Look what it has done to some nice programmer’s code! If it were a film it would probably be [insert name of gore-fest horror pic here]. The latest (and greatest?) version of the mighty Microsoft’s browser, Internet Explorer 7, which erm … well, to be honest, fares only a little better than its little brother (browther?). If it were a film it would probably be the sequel to [insert name of gore-fest horror pic here]! And then Opera 9 steps up to the plate and delivers 100%. That is how the page should look. If it were a film it would be your favourite feel-good movie, one that you could watch day-in, day-out. Lovely. Imagine if your tv did this to the programs, videos or DVDs you watched. Viewers wouldn’t stand for it. So why do web users stand for it? The moral of the story is don’t use Internet Explorer, use something better. I can thoroughly recommend both Firefox and Opera, which I’ve been using for a good few years now. If you like customizing your software, with various add-ons, then choose Mozilla Firefox. If you just like a fast, attractive browser that shows things the way they should look then download and install Opera 9. If you’re using Mac OS X then you are probably using Safari already, which I believe is pretty cool. And if you are using Linux then you’ve probably already compiled the Konqueror source code and installed it on your Ã¼ber-geeky homemade distro yourself, and I’m preaching to the converted!